The NBA has already written to about 10 major biopharmaceutical companies to comply with the provisions of the Biodiversity Act (2014 guidelines). 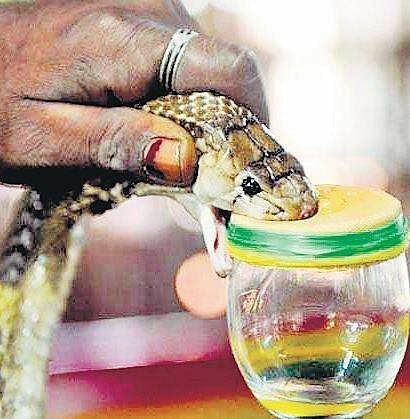 CHENNAI: The Irulas, India’s most experienced snake venom extractors, will soon be getting a better deal. The National Biodiversity Authority (NBA) and the Tamil Nadu Biodiversity Board have started the process of streamlining anti-venom production by bringing the biopharmaceutical companies, which buy venom stocks from Irulas, under Access and Benefit Sharing (ABS) of Biodiversity Act, 2002. The NBA has already written to about 10 major biopharmaceutical companies to comply with the provisions of the Biodiversity Act (2014 guidelines). Once the ABS is fully enforced, the companies have to seek approval of the Tamil Nadu Biodiversity Board for access to the biological resource (snake venom). If the company has a foreign connection, the NBA will give approval. Terms and conditions for access will be laid down in consultation with the Irula community and the block-level Biodiversity Management Committee.